The Winter Swap on Linda’s 'A Swap For All Seasons' blog was to make one mini fabric collage measuring 5” x 7”. Linda paired up all the participants and advised us that as long as the base was fabric, we could build from there use any medium as long as it was whatever we thought our partner would like. My partner for this swap was Hope of Pixie’s Ponderings who now lives here in the UK in Lincolnshire but is originally from (as she puts it) ‘the wilds of Northwest Arkansas’ in the USA. Hope described her style as eclectic and gave me quite a lot of information as to what she liked. I narrowed it down for the collage to ‘toadstools, owls and natured-inspired stuff’ She told me there were no colours she disliked and that she leaned towards whimsical in style. I started off with a cotton then sturdy webbing base (as described in a previous post). I built up a landscape with various colours of organza fabric which were held into place with the tree which I machine stitched on. The tree is brown felt cut from Tim Holtz’ Alterations Sizzix ‘Branch Tree’ die. I hand stitched the flowers with beaded centres on and the cute little wooden owl buttons (I painted in their eyelids as they looked a bit scary otherwise). I added Glossy Accents to their eyes too so they look all twinkling in the moonlight! The moon is a piece of silver ribbon highlighted with some Ranger’s Stickles (Crystal colour) and I also highlighted some of the branches of the tree with it to look light moonlight. I suppose the background should have been darker if it’s night time, but this is a whimsical piece so I think I can get away with it! The (intentionally) wonky picket fence around the tree is a piece of lace cut from Tim Holtz’ Alterations Sizzix ’On The Edge’ die called ’On The Fence’. I wasn’t sure if lace was going to work but I was pleased with the result. The toadstool is another wooden button which I coloured with paint and more Stickles and added Glossy Accents to the top. I finished it off with some assorted fibres and lace. Here’s what the back looks like. I made an image transfer onto fabric using Golden’s Regular Gel (matte) medium and a print onto copier paper with my inkjet printer. I did intend to use the image transfer somewhere on the front of the collage, but as it evolved there was no place for it, so on the back it went - and it became a useful place for my details! We were to leave our pieces unfinished so our partner could decide how they wanted to use them. I made a card to go with the collage with an appropriate verse (photocopied from a book of music and suitably aged with some Distress Inks). You may be able to see another wooden owl button in it's un-painted state - with the scary eyes! I’m pleased with how the collage turned out and am so glad that Hope likes it too (phew, that's a relief!) I’m looking forward to receiving mine in return. Thanks Linda for organising another great swap, I really enjoyed this one! I signed up for this swap last December which is being hosted by NoodleBubble (just click on the picture above to go to her blog). The theme was "Handmade Hearts" we needed to make something heart shaped, any medium as long as it was handmade 'anything goes'. Noodlebubble allocated us a secret swap partner and told us who we should send our hearts too in good time for Valentines Day. Well, this morning I received my heart, what a lovely surprise it was too. who paints the most beautiful whimsical portraits and she very kindly also sent me one of her magnets and a card with her prints on - I love them all! Thank you again Karen. The heart I made is for someone who doesn't have a blog and she doesn't know her heart is coming from me, so I think it's safe to post some pictures now! My heart started off a card shape which I covered with Plaster Cloth, embedded some tiny gems into and painted with acrylics and embellished with some small beads and finished with a hanging glass bead. You may have guessed already, my swap partner's name is Vicky! I hope she likes the colour green as she's getting a green ATC with an altered domino on too! My heart will go off in the post tomorrow for Vicky. event which starts on 30th January - I hope you'll come and visit me for a chance to win one and I may see you along the way! I haven't made a paper doll for a while so thought I'd keep my hand in and made this pretty one. as long as it fits the colours pink and green. Do you like her pink knitted jumper? It was an off cut of machine knitting my Mum gave me which I chopped and stitched﻿. It's not exactly a jumper but more a cropped top with arm warmers - maybe she's a dancer - if that's what dancers wear! She's stopped dancing now - lol, to show off her lovely sheer ribbon skirt which is attached to the body with a few stitches at the waistband. There isn't much green is there? Have a look under her skirt! Her stockings are actually sheer light green ribbon attached to her legs with Glossy Accents and two cute heart shaped buttons at the top. She has green in the ribbons in her hair too. Her hair was a piece of thick black braid I had in my stash which I unravelled to make her lovely curly hair! She also has green flower ankle warmers - like all the best dancers! Just in case you're interested, here's what the back looks like. not as pretty as the front! 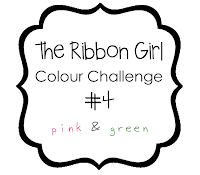 The Ribbon Girl challenge ends on 30th January and there are some ribbony prizes for the lucky winner! Good luck if you're taking part too! I mentioned in my previous post that Jan of Jan's Arty Journey makes the most amazing altered matchboxes - well here's the proof! I received this beauty in the post today and my photographs really don't do it justice, it is fantastic! It has a lovely UTEEd altered jigsaw piece on the front as well lace and sewing notions - all the things I love! Look what was crammed inside! I particularly love the tiny cotton reel and the altered bottle cap. Everything was beautifully packaged and there was this gorgeous tag attached too! This is another matchbox I altered for a one to one trade with a sewing theme and now I know it's been received I can post it here. The dress form (from Character Constructions) was rubber stamped (with Dew Drop Brilliance ink) onto Shrink Plastic and stuck onto the box with E6000 adhesive. The drawer pull is a little bit of Tim Holtz tape measure attached with an eyelet. Inside is a small assortment of sewing bits and pieces. The mannequin was moulded from air dry clay from the 'Mini Torso Set XXLge' by Krafty Lady. Once dried, I covered it with Tim Holtz tissue tape and attached some finishing ribbon and a button. I'm looking forward to receiving a matchbox from my swap partner Jan who makes the most amazing altered matchboxes! I think I may have another addiction (as well as altering matchboxes that is!) - fabric collages! This post follows on from the previous one where you'll see I've made 3 of these collages in not as many days! Here's a brief summary of how I put the 'Daisy Cottage' fabric collage together. and re-inforce it with something sturdy - I had this roll of strong hessian type stuff which was ideal. I machine stitched up and down each row and top and bottom, this is what the back looked like when I'd finished. That's the base done, now to start decorating the top. I decided to use some paper - sheet music and aged it around the edges with Distress Ink. The next stage is the most time consuming, but also the most fun - sorting out what layers to use. I laid the various lace and fabrics onto the base before stitching anything down to get a rough idea of what it'd look like. When happy with it, start stitching! I coloured a bright white lace flower from a curtain edging (thanks Mum!) with Distress Inks ﻿so it blended in better. I also added a few beads to the cross stitching, a vintage button for the centre of the flower, some hanging beads at the bottom and a horseshoe for good luck at the top right hand corner. I gave it a simple hanger of twine (braided three lengths together and knotted them at the back). Here's what the finished back looks like. I think I now need to go shopping and hunt down more cross stitched cast offs, lace, buttons, keys - and anything else which I could use to make more - these addictions must be fed - lol!